Accounting is often overlooked when setting up a company in Hong Kong, despite its indispensability. At Fung, Yu & Co, our job is to make accounting simple, understandable, and practical for all our clients, especially those entering Chinese markets for the first time. We can provide you with comprehensive accounting, bookkeeping, and financial reporting services, so your company has access to the accurate and up-to-date financial data you need in avoid unnecessary risks and costly failed investments. One of our most valuable services is guiding you through the complicated process of organising a corporate bank account. It is crucial to have a corporate account with a Hong Kong bank at least, so you can conduct business in HK —but there is no guarantee that you can get one on your own. While other personal and business accounts are easier to open, the corporate account process requires a savvy local partner to help you navigate it. Fung, Yu & Co. stands ready to be that partner for you. Overall, the banking system in Hong Kong is characterised by excellence. That said, most banks are very cautious about opening a corporate bank account for a foreign-owned corporation. It can take 1-4 months to establish the corporate account you need so that your company can start using it to trade in Hong Kong and the mainland. 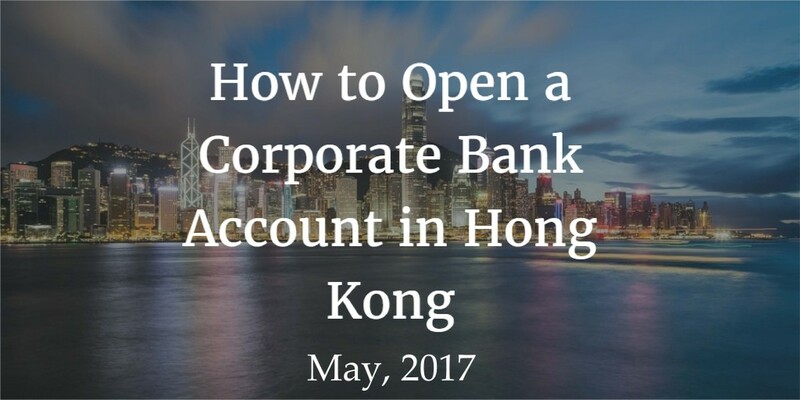 At one time, getting a corporate bank account in Hong Kong was quite easy, with completion occurring within just a few days, and could often be done from branches in other countries. However, after several major Hong Kong banks ran afoul of foreign regulators, this easy access came to an end. Although China’s increasing liberalisation has eased the process somewhat recently, foreigners still face significant restrictions when attempting to open a new corporate account in Hong Kong. Banks in the SAR typically demand a great deal of paperwork, and after a long wait, may still refuse to open an account for you. Regretfully, in the past, the sheer difficulty of starting a corporate banking account in Hong Kong has driven foreign investors away. In part, this difficulty arises from the fact that many of the Chinese banks in Hong Kong are still government-owned, and by international standards, are neither efficient nor transparent. However, it has become clear that the Chinese economy will inevitably eclipse all other Asian economies and many Western economies—as long as any difficulties hindering its continued growth are cleared away. This has encouraged the government to simplify the process of by which corporations in both HK and China go about getting their official accounts with banks. This has not happened overnight, but little by little, banks have been streamlining their corporate account processes. The entry of international financial organisations like DBS bank and Citibank into the Hong Kong and mainland markets have also encouraged greater efficiency. Competitive market forces have also been chipping away at the existing corporate account restrictions. A detailed description of any ultimate beneficial owners for nominee shareholders. As a new business, you will also require an initial minimum deposit (which varies depending on the bank), a Certificate of Incumbency, and a Certificate of Good Standing. Due diligence requirements may also require all directors and principal shareholders to be physically present in the city at the time of the opening of the corporate bank account. Although the corporate bank account opening process in Hong Kong may be complex, we have done it so many times that it has become second nature to us here at Fung, Yu, & Co. We will assist with all the required documents, deal with the associated agencies, and advocate for your needs during the progress. We possess a well-honed familiarity and facility for accomplishing this crucial task, especially with HSBC Bank and DBS Bank in Hong Kong, and the Bank of China in mainland China. We respect each of these organisations and they respect us, due to our long relationships with each, as well as our decades of experience. We can also help you with obtaining a corporate banking account with other banks in Hong Kong, if an HSBC business account or DBS business account proves insufficient; if you wish to expand into another niche that these banks lack experience or interest in; or, sadly, if your petition for a corporate account is either denied or an existing account is frozen, which happens on occasion.